Hiya guys! 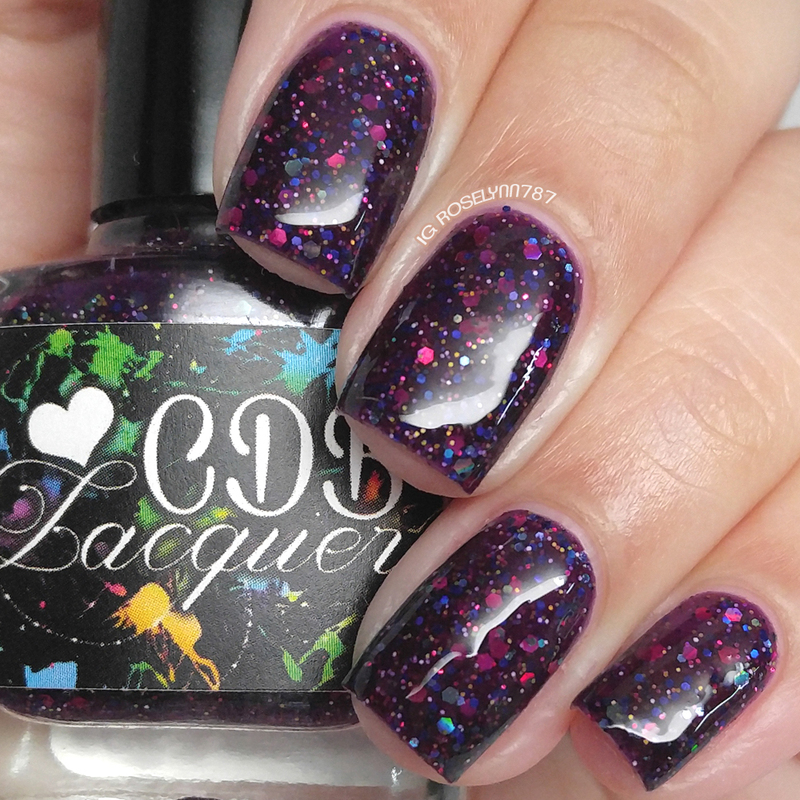 Today I am sharing a very special review with a brand that is near and dear to my heart, CDB Lacquer. Cheyenne was one of the first makers to give me a chance as a swatcher and blogger. She took a big leap of faith trusting her products to a complete novice and that's something I will always remember. 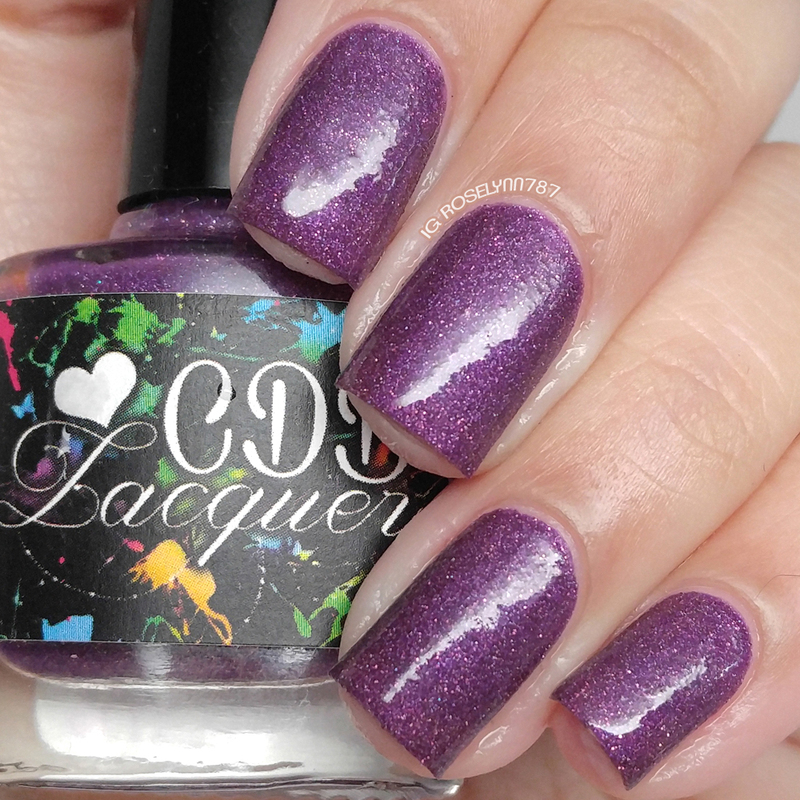 I'm not normally this mushy, but CDB Lacquer is turning two and with that is releasing a special Indie-Versary Duo! Let's go ahead and get started with this review! The 2 Year Indie-Versary Duo by CDB Lacquer will be available for purchase February 1st at noon EST. Each full-size bottle will retail for $8.50 each and the duo set will retail for $16.00. Keep on Believing can be described as a dark purple jelly with numerous glitters in different sizes. So squishy! For a jelly polish this ends up having a much more opaque application than anticipated. The coats layer nicely and there is ample glitter in each brush stroke. There was a bit of dabbing here and there to make sure the glitters wouldn't clump up in certain areas. I could have probably got away with just one layer of topcoat, but I wanted a little extra shine with my squish. Shown here is two coats and double the topcoat. Have Faith in Your Dreams can be described as a purple to pink scattered holo thermal. My big must with a thermal is that it has to have a noticeable transition and this one definitely hits that check-box. For my swatches, I used hot and cold water to trigger the transitions shown. The formula has a good consistency, not too thick or thin and has an even opaque application. It dries to a semi-gritty finish, but a thick layer of topcoat easily smoothed it down. Shown here in two coats and a glossy topcoat. Overall the Indie-Versary Duo is a fantastic representation of what Cheyenne does best, glitters and thermals. The formulas are as I have come to expect from CDB Lacquer over the years and have a great application with just two easy coats. I love the color selection for this duo as well (I mean who doesn't love some good purples, right?!!?) they are really fun shades to wear year-round. If you haven't tried out this brand yet, then this is definitely the duo to kick off your addiction with. 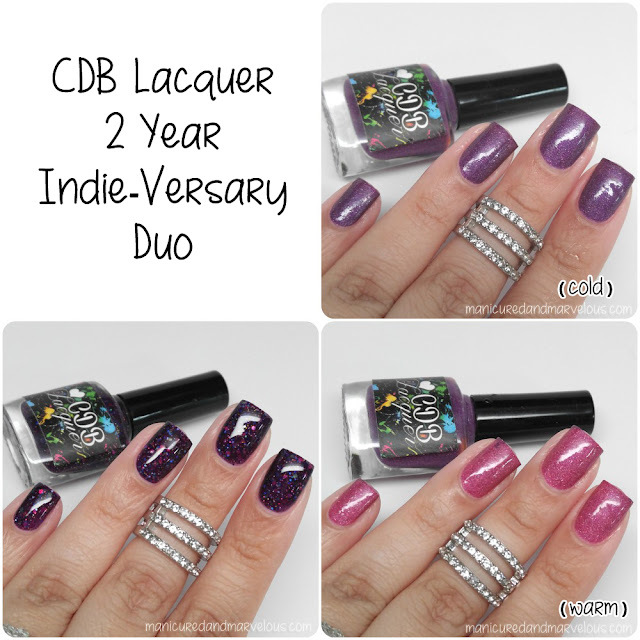 As I mentioned earlier, the 2 Year Indie-Versary Duo by CDB Lacquer will be available for purchase February 1st at noon EST. Each full-size bottle will retail for $8.50 each and the duo set will retail for $16.00. I love Keep On Believing. I have trouble with thermals but I love looking at them. I also really like her bottle shape, its very unique. These are beautiful, and they look like they play well together. Love these both so much! Thank you for such flawless swatches! Beautiful! That thermal!!! What a shift! keep on believing is so squishy, jelly of my dreams!!! this is definitely on my "brands to try" list for this year. Yeahhhh that thermal is amazing! Both polishes are so pretty, but I'm really loving Keep On Believing! Squeel!! These are so pretty!